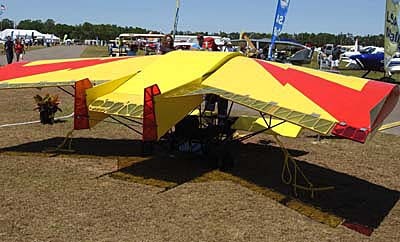 The updated Lightning Bug shown at Sun ‘n Fun 2018. For the second year in a row, I was blown away with Lightning Bug. It changed enough that I tagged it Lightning Bug 2 even if designer/developer Brian Austein did not call it that. Let me make a key point: Lightning Bug was a $3,000 aircraft project, with the cost split between two engines — model radio control aircraft engines, by the way! — and $1,000 more for the airframe. 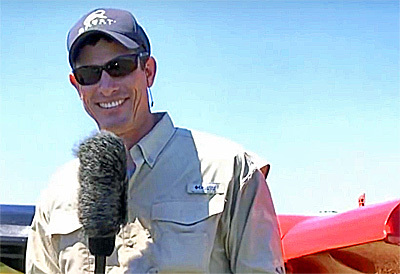 The rest was Brian’s talent and drive to design and build the ultralight. So, let’s recap. If you had Brian’s abilities, you could have an airplane for three grand. If you don’t find that amazing in a time of $150,000 (up to $350,000!) Light-Sport Aircraft, I don’t know what impresses you. 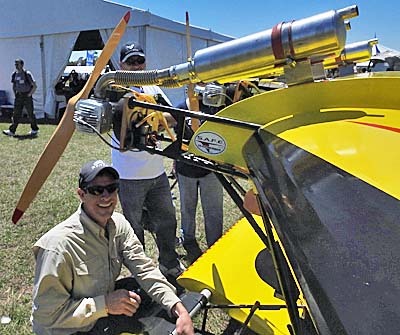 The unique airplane certainly impressed often hard-to-convince judges who gave it not one but two awards in 2017: Grand Champion and Best Innovation. For comparison, here is the dual-award-winning Lightning Bug as seen at Sun ‘n Fun 2017. 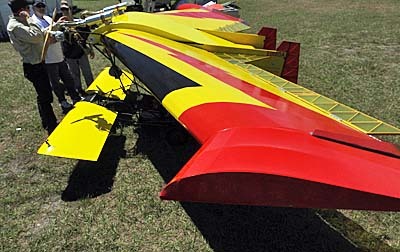 Lightning Bug was partly an experiment to prove, as Brian said, that “I could build a [man-carrying] airplane that could fly with RC model airplane engines.” Models have gotten ever larger, converging with Lightning Bug that weighs a mere 140 pounds (no, that’s not a typo). Modifications made to accommodate a larger pilot boosted empty weight a bit but Brian indicated it’s still less than 150 pounds …104 pounds under Part 103‘s supposedly tight constraints! This surprising little aircraft even has an auto pilot. All I could do was shake my head incredulously. As you can see in the video, it appears to fly very well. If I could create an airplane like Lightning Bug, I would sit back and admire the result. Yet this is actually Brian’s second aircraft design. Our video below shows you his Woodpecker, another very-modest-cost design that looks more conventional. Not one to sit still, Brian hinted at more ideas his fertile mind is conceiving. I find his achievements remarkable. Can You Help a Fellow Ultralighter? For the moment, Brian is not designing. He’s fighting for his very survival. …literally! I am about to do something I never do on this website — for many reasons — but which I find worthy in this case. Let me have Brian’s good buddy Jon Bailey tell you himself. “I am a very close friend of Brian Austein. I am writing you to inform you that the day after Sun ‘n Fun 2018 (on Monday April 16), Brian was diagnosed with Stage 4 lung cancer. It has moved into his brain. Brian is a fighter and he is fighting a tough battle right now. He is currently in Atlanta under evaluation for a second opinion. I will take him to another doctor on Tuesday (May 22nd) for his opinion. “Please keep Brian and his family in your thoughts and prayers during this time. Absolutely, Jon, I will put out the request and I have already contributed myself. Here’s the GoFundMe link. Please help if you can. I also never put out an individual’s phone number but if you can help in any way or just want to offer encouragement, please call Brian’s good buddy, Jon at 662-229-8281. Buenos dias. Recien estoy viendo su ULM, y quede maravillado, es hermoso y muy ingemioso, lo felicito. Pero al mismo tiempo que de muy sorprendido e impactado, por la salud de Brian A. No se como va su estado de salud, pero de corazon le pido a Dios, que tenga una mejoria significativa de su salud, este tremendo hombre y tan ingenioso, y un buen amigo, que estee con nosotros por mucho mucho tiempo mas. Querido Brian que Dios te bendiga y que sigas contruyendo aeroplanos, lo que se llama “ El maravilloso mundo de construir y volar ” un gran abrazp, y te admiro, desde Saud America. Hello Eduardo: [COMPUTER TRANSLATION] Good morning. I am just seeing your [ultralight aircraft] and I am amazed. It is beautiful and very ingenious; I congratulate you. But at the same time [I am concerned] for the health of Brian A. I do not know how his health goes, but in my heart I ask God [for] a significant improvement of his health [for] this tremendous man … [I hope he] will be with us for much more time. Dear Brian: God bless you and [I hope] you continue to build airplanes. I admire you, from South America. DAN’S REPLY — I have no further information on Brian Austein’s health but share your concern as well as your admiration of Brian. Thank you for your kind words. [COMPUTER TRANSLATION OF REPLY] No tengo más información sobre la salud de Brian Austein, pero comparto su preocupación y su admiración por Brian. Gracias por sus amables palabras. Unfortunately, Brian succumbed to this dreadful disease on October 4th, 2018. These are the funeral arrangements for Flyin’ Brian Austein. Thank you everyone for your calls and prayers. Brian is resting peacefully now with the Lord. Hi Carolyn: I was so sad to receive this message from Brian’s friend, Jon. Just wanted to pass along to you that Brian passed away this morning. He isn’t suffering anymore. Brian thought a lot of you and was grateful you gave him the time and energy to share his craft. He will forever be missed by many! !